The cichlid eye does not specifically differ from the general fisheye Bauwplan: two slightly forward directed, laterally placed bowl-shaped structures with spherical lenses that cannot be distorted. The crystalline lenses are layered, somewhat like onions, with an increasing refraction index from the periphery towards the centre, which considerably lessens the spherical and chromatic aberration of the eye lens (Jagger, 1992). Sivak (1990) points out that the fixed focal length (f, which can be expressed as a function of the lens-radius r) varies inter-specifically between 1.99r to 2.82r. 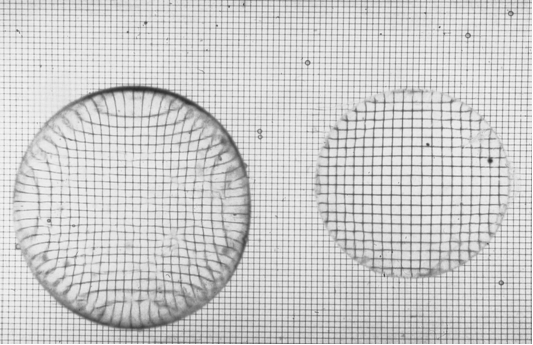 Accommodation results from the movement of the lens in the pupillary plane with a slight axial displacement, using a small muscle, the musculus retractor lentis, and the antagonistic ligamentum suspensorium (Beer, 1894; Munk, 1973; Fernald, 1990). Contraction and elongation of the muscle cause transposition of the lens with respect to the retina and thus change the image-distance (i) in a certain direction which enables a fish to produce a sharp image of an object at a certain object-distance (o) in the opposite direction (further referred to as imaging). It is a well-known fact that fish-eyes grow continuously throughout life (e.g. 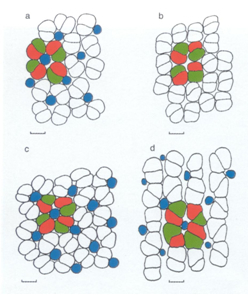 Powers & Raymond, 1990; Kröger & Fernald, 1994; Van der Meer, 1995; Zygar et al., 1999). Furthermore, isometric growth of the fish-eye is generally accepted: for the ratio between the lens-radius and the distance to the retina, also called Matthiessen’s ratio (1882), is – except during early development – a constant and independent of eye-size (e.g. van der Meer, 1994; Pankhurst & Eagar, 1996; Poling & Fuiman, 1998; Kröger et al., 2001; Matsuda et al., 2005). The cichlid retina shows the layered characteristics of the vertebrate retina with a pigment-epithelial cell-layer on the outside (sclerad) covering the photoreceptors (rods and cones). 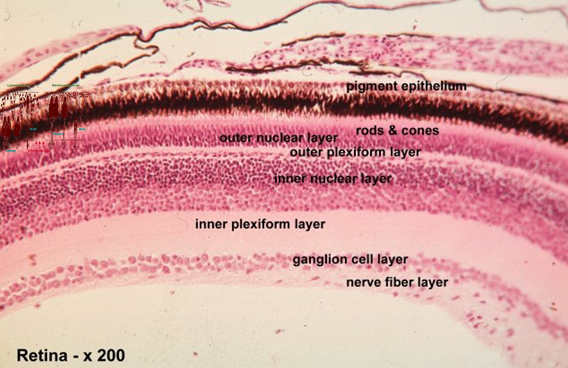 The photoreceptors are connected via various complex networks of intermediate neurons (horizontal-, bipolar- and amacrine cells) to the most vitread positioned ganglion cell layer. All separate ganglion cells axons are collected in the optic nerve. 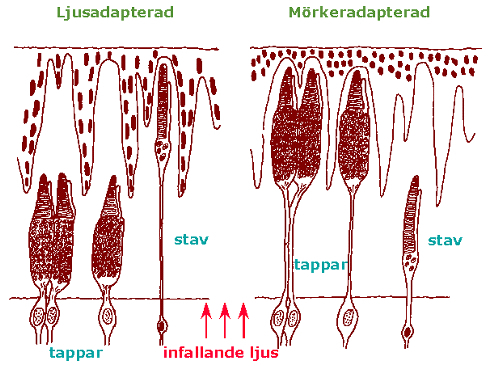 Generated by the environmental light conditions the rod- and cone photoreceptors can change position through migrating movements together with the melanin particles in the pigment-epithelial cells (retinomotor response; Ali, 1975). Cichlids have no fovea and there are no blood vessels inside the retina. 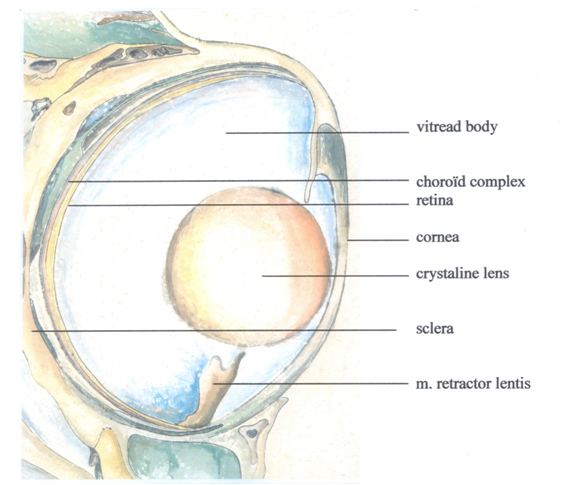 Instead there is a rete choroideus of small vessels outside the retina and a few vessels embedded in the so-called falciform process entering the retina near the optic nerve and running towards the periphery where the m. retractor lentis is attached. Rods and cones differ by their photopigment membranes. The photopigments in rods and cones are a mixture of rhodopsins and porphyropsins. The cichlid cones hold three different kind of porphyropsins which enables the fish to distinguish colours (Bowmaker, 1995). The cones are also arranged according to a regular mosaic of four double cones surrounding a central single cone. The two members of double cones hold alternate red- and green sensitive photopigments and the single cones hold a blue sensitive photopigment. Probably depending on the environmental light conditions, the single cones may be partly or entirely absent. In the latter case the double cones form a row pattern (Van der Meer et al., 1995).